This week, the last remaining abortion center in Nashville, Tenn. closed its doors. Dr. Brent Boles provides an overview of how and why the pro-life movement is advancing. 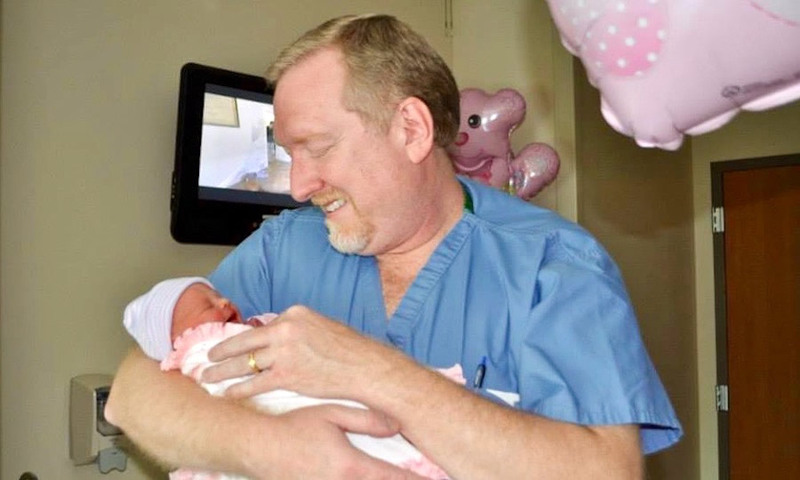 An OB/GYN for over two decades, Dr. Brent Boles holds a child he delivered. Boles has been involved in recent statewide efforts in Tennessee to protect women and children from the abortion industry. These are interesting times in the battle over abortion here in Tennessee. Four years ago, an effort to amend Tennessee’s state constitution was successful. Years in the making, it was one of the most expensive and vigorously contested ballot measures in the state’s history. It has led to passage of commonsense laws to regulate the abortion industry. As a practicing OB/GYN for the past two decades, I’ve often seen women who were violated by substandard care at Planned Parenthood. I know firsthand how abortion leaves women and families broken. This change was necessary after four of the five justices on the state’s Supreme Court had ruled in 2000 that Tennessee’s 200+ year old constitution contained a fundamental right to abortion. Following that decision, very little abortion legislation had withstood the inevitable legal challenges mounted by the abortion industry. Abortion clinic personnel are trained to conceal the real nature of the unborn at every turn. They know well-informed women are less likely to go through with the procedure. As was expected, the abortion industry challenged Amendment 1’s passage. They could find no real legal or constitutional basis for their challenge. In their desperation, they challenged the manner in which the votes were counted. They lost at every turn as the case worked its way up the ladder in the federal judiciary — to the Supreme Court of the United States. On October 1 of this year, the high court declined to hear the appeal, allowing the lower court decision and Amendment 1 to stand. In the wake of Amendment 1’s passage, one abortion policy change passed by the state legislature will take effect on January 1, 2019. HB0108 will require that an ultrasound examination be a part of the process for women seeking an abortion in Tennessee. The law requires the individual performing the ultrasound to offer the woman an “opportunity to learn the results of the ultrasound.” The ultrasound report will also be required to document whether or not a heartbeat was detected. This law strikes at the heart of the abortion industry’s pattern of behavior. Women are often denied their right to know the truth about what is happening in an abortion. Abortionists know that well-informed women are less likely to go through with the procedure. Abortion clinic personnel are trained to conceal the real nature of the unborn at every turn. They do not truthfully and factually discuss the nature of the unborn baby and what will happen to him or her. Instead, they use deceptive language and euphemisms to make it less likely that a woman will change her mind about seeking an abortion. They refer to the baby as a ‘clump of cells’ and equate him or her with a pair of tonsils, an appendix, or a pile of toenail clippings. For over ten years, I have been the medical director of a pro-life pregnancy center called Portico. What we find at our center proves the importance of ultrasounds for women who may be considering abortion. Established more than 30 years ago, Portico offers free ultrasounds and pregnancy tests to women experiencing an unplanned pregnancy. Half of the women who walk through our doors fall into the category we call ‘abortion-minded.’ That is, they are either sure they plan to have an abortion or are considering it. Abortion clinics usually do not show the patient her ultrasound images. They do not want the patient to see her baby. Clients of Portico experience the staff’s compassion, hear the truth about life and see an ultrasound. Less than five percent of women are still ‘abortion-minded’ when they walk out the door. Seeing life in that fashion is a striking experience. Abortion clinics usually do not show the patient her ultrasound images. They do not want the patient to see her baby. Portico also has a mobile ultrasound unit. Some days, it has been parked down the street from one of Nashville’s abortion clinics. Recently, a patient who had just finished her pre-op appointment at the abortion clinic was clearly upset. She came to our mobile unit, and tearfully asked if she could have an ultrasound to see her baby. Our staff learned she had asked the abortion clinic sonographer to show her the baby, and the person had refused. We took her in and gave her the ultrasound. Once she saw her baby, she broke down in tears. At that moment, she decided she would not have an abortion. Clearly, this new state law will change hearts and minds — and save lives. For many years, those seeking abortion services in Nashville had two locations of providers. The Women’s Center has long been located in south Nashville. Their lack of quality care was showcased in one of the most impactful ads supporting Amendment 1. The recording of a 911 phone call originating from the Women’s Center was obtained by Amendment 1 supporters. In the recording, we heard the chaos surrounding the care of a woman in critical condition following an abortion. If abortion clinics were held to the same quality standards as legitimate medical facilities, all personnel involved would have known what to do in an emergency. They would have been easily able to locate emergency supplies, drugs and equipment. Ironically, years before, the owner of the Women’s Center was the plaintiff in a lawsuit. The court prevented abortion clinics from being inspected to see that they meet safety and cleanliness standards. After the passage of Amendment 1, the owner challenged a law that applied to any Tennessee clinic that performs more than 50 abortions annually. It required his facility and others to comply with ambulatory surgery center safety standards. Despite that 911 call broadcast for all to hear, he still didn’t care enough about the patients to meet basic medical safety standards. In August of this year, his clinic ceased operations and has not reopened. That left the Planned Parenthood clinic as the only facility in Nashville in which women could seek an elective abortion. This past Monday, December 10, Planned Parenthood of Tennessee announced that its Nashville location would no longer be providing abortion services. They began referring callers seeking abortion services to providers in Knoxville and Memphis, two other large cities in Tennessee. According to an article in the Tennessean, Nashville’s largest newspaper, a Planned Parenthood spokesman also attributed the cessation of abortion services, at least in part, to a shortage of abortion providers. The author of that report visited the Nashville Planned Parenthood location on Monday morning. She noted that the waiting room in the facility was completely empty. There are two important takeaways here. First, if abortion is really only three percent of what Planned Parenthood does, where were the other 97 percent of their patients on Monday morning? Where were all the patients who couldn’t get pap smears, cancer screening, STD checkups, and birth control anywhere else? If “abortion is normal,” then why aren’t more medical professionals willing to provide abortion services? They weren’t there because the 3 percent claim is a lie, and so is the claim that many women have no alternatives to Planned Parenthood. Abortion is far more than 3 percent of what Planned Parenthood does. When you take out the half a billion dollars of Planned Parenthood’s annual revenue that comes from the federal government, 80 percent of what remains comes from abortion services. The second and less obvious point has to do with the gynecologists who perform abortions. Those who are most aware of what abortion does are almost universally unwilling to do them. I have always found it somewhat puzzling that OB-GYN colleagues I know will say that they are “pro-choice.” But they are personally unwilling to do the procedures themselves. “Abortion is normal,” stated the author of Shout Your Abortion in a recent interview. Then why aren’t more medical professionals willing to provide abortion services? Could it be the procedure itself is deeply disturbing in its brutality? There truly is a moral dilemma surrounding the baby and his or her right to live. The fact that they cannot find anyone to work and keep their clinic open says far more about the real nature of abortion than they will admit. Learn more about the work of Portico pregnancy care center. Explore The Stream’s coverage of human life issues, and sign up to receive top stories every week. Bless you and your family Dr. for sharing such insightful news. We live in a pretend world and one of it’s fantasy pillars is that abortions are all done by experts in sanitary, professional environments with non-expired medicine. The abortion pretend pillar says that’s not a baby in the womb and the aborting mother will have no emotional consequences even in a medically perfect abortion. All lies. It is good to see these major cracks in the pretend world pillar of abortion. I pray it crashes to the ground someday. Satan, the father of lies, hates it when the truth comes out. Would that it were not only Nashville, but Memphis, Knoxville, Atlanta, Los Angeles, New York, Tokyo, Beijing, Moscow etc.! It is long past due for the Supreme Court to look at the scientific medical evidence, and make a finding of fact as to whether an 8 week abortion takes a human life. And then a six week abortion, etc. The answers of course are indisputable. But such answers must be adjudicated into law. Let us not kid ourselves: if the USSCt would overturn Roe, that means that the issue will revert to the States where it properly belongs. Each State can continue it or forbid it. NY, CA, FL, IL, MI and a few others would all continue it though a few others would restrict it much more severely. Once the woman is compromised — thanks to feminism and cultural marxism which spawned it — the Family is compromised. And once the Family is weakened, the nation is done. DR. BRENT BOLES – you are a true hero. Some days are so hopeless as I read about young people murdering their preg. girlfriends or leaving a baby in a box along the CA highway. We have a large group of misguided teens right now who get duped into believing they are doing the ‘right’ or ‘cool’ thing – yet they end up never the same and alone (or dead). 2 major planks of the democrat platform….open borders and abortion. Kind of says it all.